Engineering Foundation It all starts with engineering, not business models. Full Spectrum Laser’s focus on engineering starts with an unwavering dedication to understanding what advanced technology can do to simplify your workflow and increase productivity. FSL’s exclusive RetinaEngrave line of software and controllers represents thousands of hours of engineering effort to ensure best in class laser experience through tight integration of hardware and software designed from a single company. Legacy and Stability We love startups. We were once a startup ourselves. That said, we are glad we have survived that “learning” period so many companies fail to get past. With over a decade of delivering quality laser systems since 2008 and over 50 full-time employees, FSL ensures your purchase delivers years of reliable service and support. Through constant research & development, setting goals to improve ourselves, and incremental growth we have created legacy and stability for ourselves and our customers. With most of our products benefiting from over five years of development and market availability, we are past the mistakes of idle promises. Our machines do what we say they do and our quality is confirmed with machines that have been in heavy use by professional manufacturers and hobbyists for years. In-House Development From hardware to software engineering, to developing our own chemistry for 3D printer resins, Full Spectrum Laser thrives on being leaders of research and development of all things laser related. This requires a dedication to hiring the best engineers, chemists and software developers available, which to us is the bare minimum to control quality and reliability. It is a long and costly process, but well worth the effort when our customers see the results. Quality Components The electronics and software are the most important aspect of a machine and can make the difference from having an amazing tool and a doorstop. To save money, many low-cost imported machines have cheap optics, faulty design and poorly written or non-functional software that could render your machine useless. Full Spectrum Laser simply eliminates such possibilities by dedicating ourselves to quality parts and components. That means metal casings for our laser cutters, not plastic. It means better optics and electronics inside. It means we built custom software and touchscreen interfaces. In all, every component matters and Full Spectrum Laser invites comparison of components for any similarly priced machine. Unique Patents There are some things Full Spectrum Laser products can do that the competition cannot. Sometimes this is in design decisions that the customer will never know because it is so integrated into the function of the machine. Other times, our exclusive patents give us customer-favorite special features such as the removable bottom on our Muse/Hobby lasers (US20160158888A1), custom integrated RetinaEngrave v3.0 software, numerous 3D Patents (US9574039B1, US10118341B1, US9944804B1) and other capabilities only Full Spectrum Laser can offer. We own these patents because we invent the technology that advances laser application. USA Headquarters We are proud to be an American company, based in sunny Las Vegas, Nevada. More than that, having our facilities in the US gives us many advantages to our customer base. It allows us to control and monitor our quality inspection process. It allows us to stock spare parts for quick delivery. It allows us control and monitor our technical support. It even allows customers to visit our facilities and take a tour of our amazing showroom. Most of all, it keeps us close at hand for customer support and quality control. Superb Customer Record We are proud to say we have thousands of happy customers using our machines in dozens of industries, from Fortune 500 companies; to schools; to home-based entrepreneurs. Most of our machines that are 5+ years old are still in operation. 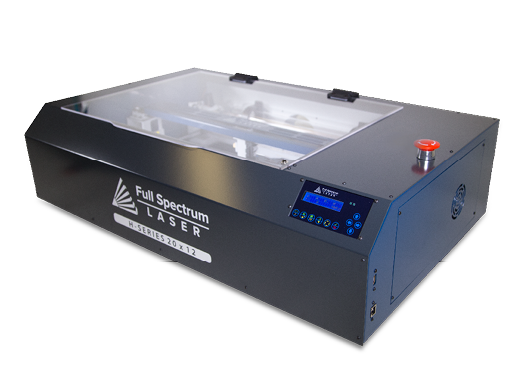 As with any business with such a high volume of customers, there may be some occasional hiccups but Full Spectrum Laser has dedicated itself to supplying the highest level of customer service possible and is dedicated to working until the problem is resolved. Community Focused Full Spectrum Laser proudly supports public maker/hacker events like Red Bull Creation in Brooklyn, NY and attends many tradeshows like MakerFaire Bay Area, MakerFaire Detroit, CES Las Vegas, ACTE St Louis, and ARA Las Vegas and more. We also provide constantly refreshed design files free to our laser cutter and 3D printer fans. Currently, we have over 23,000 fans on social media. Don’t Take Our Word For It Do your own due diligence and decide for yourself. Go visit the company or ask for a virtual tour. Check out http://whois.domaintools.com/ and see how long their website has been around. Review customer comments and, just as importantly, see how the company responds.